Once upon a time in the days of the Greek gods there was a dog named Laelaps. Now Laelaps was a special dog. He was so special because the Greek gods created Laelaps giving him a special power. They gave Laelaps the ability to always be able to catch its prey. Laelaps hunted and killed, always catching what it hunted, never once missing a kill. Now there was a Teumessian fox who was terrorizing the people of Thebes. The fox also had a special ability: it was said that this fox could never be caught. This uncatchable fox was eating the little children of Thebes keeping the people trapped, scared to go outside. 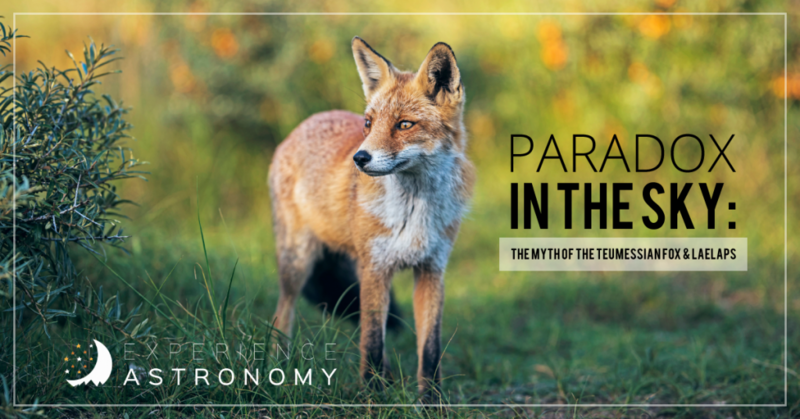 The gods saw what was happening to the people of Thebes and sent Laelaps on the foxes trail to kill the fox. Laelaps chased after the fox sniffing out its trail, trying to track it down, but the fox was so clever that it outsmarted Laelaps every move. Laelaps chased the fox through the woods always hot on the fox’s trail. Laelaps chased the fox, never quite close enough to pounce and sink its jaws into the foxes flesh, and the fox always ten steps ahead of the dog. A dog that always catches its prey and a fox that can never be caught. The god Zeus saw the paradox and so he decided to turn the dog and fox into stone. He threw them into the heavens. The rocks hurtled through the sky and they became the constellations Canis major and Canis minor. 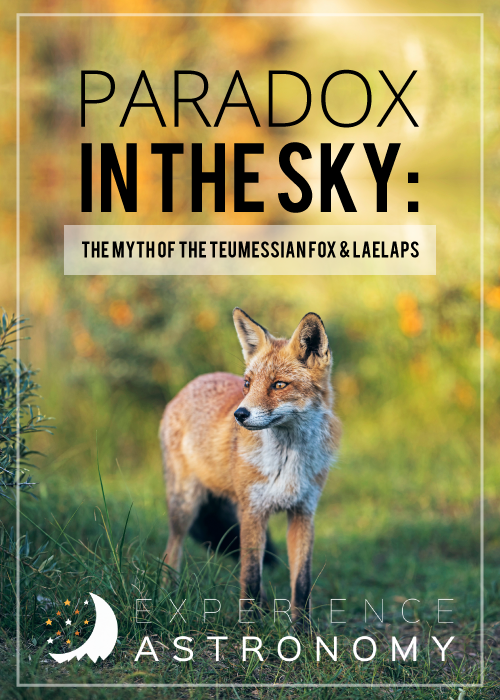 Now Laelaps and the Teumessian fox are chasing each other in the sky, Laelaps always so close, the fox just out of reach, each running forever until the end of time. This article is by Kylia, age 14, an Experience Astronomy student from Olympia, Washington.